The new model will go on sale in Europe in May, and could hit the US streets sometime soon after. Audi has released some new pictures and a couple of videos of the new A8 Hybrid, as well as first snaps of the long wheel base A8 L hybrid, ahead of the car arriving in European showrooms in a couple of months&apos; time. There&apos;s no word on whether Audi will be bringing the hybrid to the US, but given our affinity for hybrid models and the fact Audi has converted metric fuel consumption figures and emissions into US units, it could be on the cards. To recap, Audi&apos;s frugal flagship hybrid comes with a 2.0-liter TFSI turbocharged four-cylinder engine coupled to an electric motor in parallel hybrid form, combining to deliver 241hp and 354lb-ft of torque. The powerplant can drive the wheels independently or together and can shift the hybrid from 0-62mph in 7.6 seconds, which is pretty impressive for a large luxury sedan that manages fuel economy of 34 mpg. In all-electric mode it can travel up to 1.9 miles at 37mph, while top speed is clocked at 146mph. As for the A8 L, this is the long wheelbase, executive limousine variant of the A8. The extra length provides luxury rear-seat space, with optional power-adjustable and heated rear seats that come with optional ventilation and massage functions. 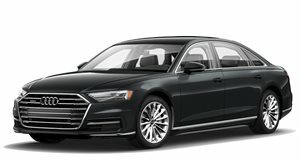 Pricing starts at $77,700 for the standard A8 hybrid and $85,400 for the A8 L Hybrid.